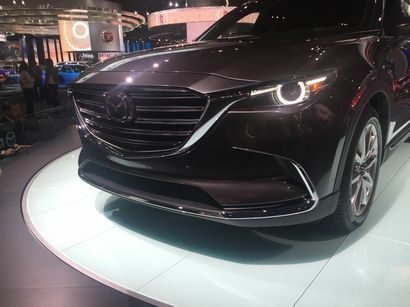 Mazda North American Operations has released EPA-estimated fuel economy figures as well as pricing information for its all-new 2016 CX-9 midsize crossover. 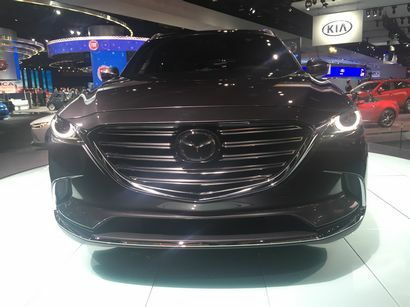 Unveiled a scant five months ago at the 2015 Los Angeles Auto Show, Mazda has already begun production on the all-new version of its midsize crossover and has released pricing information as well as availability and EPA-estimated fuel economy numbers. 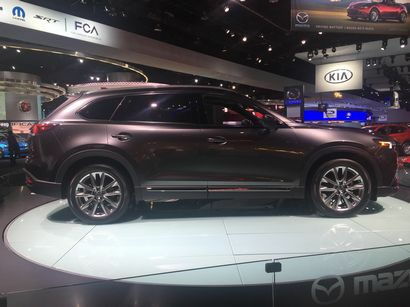 The 2016 CX-9 will be offered in four trim levels. The first three are familiar and include Sport, Touring and Grand Touring, while Mazda has added a new top level trim, the Signature model. 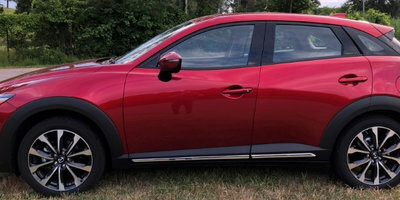 Even the base Sport model comes with a fair level of standard equipment including the usual power features (windows, locks, mirrors) plus LED headlights and taillights, cloth seats, an electronic parking brake, 18-inch alloy wheels, rear backup camera, trailer stability assist, Mazda Connect infotainment that includes the brand's Commander control and a seven-inch color display. 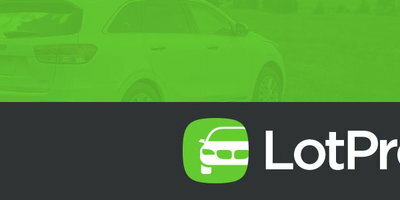 A Sport Package option adds a power driver's seat, heated front seats and heated door mirrors. 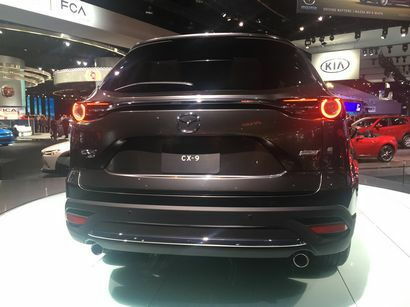 The Touring trim adds an auto-dimming rearview mirror, Blind Spot Monitoring with Rear Cross-Traffic Alert, HomeLink, leather seating (black or sand), Mazda Advanced Keyless Entry System, power liftgate, power front seats and an 8-inch Mazda Connect touchscreen display. The optional Touring Premium Package includes automatic on/off headlights, LED fog lights, navigation, 12 speaker Bose audio system, rain-sensing wipers, rear backup sensors, second-row retractable sunshades, SiriusXM satellite radio, automatic Smart City Brake Support and a sunroof. Grand Touring models add to that list with an Adaptive Front-lighting System, 20-inch alloy wheels, aluminum interior trim, an Active Driving Display (that projects instrument and navigation information onto the windshield), high-beam control, lane-departure warning, lane-keep assist, Mazda Radar Cruise Control with Smart Brake Support, roof rails and memory settings on the driver's seat. Adding to that menu, the Signature trim comes standard with Mazda's predictive i-ACTIV all-wheel drive, auburn-colored Nappa leather, rosewood trim (supplied by Japanese guitar-maker Fujigen), LED signature accent grille lighting and LED accent lighting around the automatic shifter. All four will offer the same engine, a high-compression 2.5-liter Atkinson-cycle turbo we covered in a previous article. 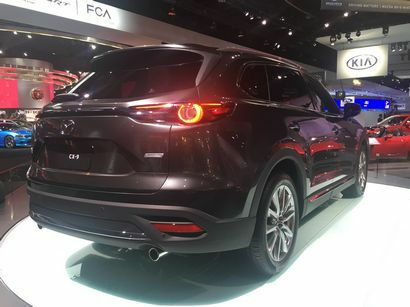 It's certified at an EPA-estimated 22 mpg city/28 mpg highway/25 mpg combined, when equipped with front-wheel drive and an EPA-estimated 21 mpg city/27 mpg highway/23 mpg combined, when equipped with Mazda's i-ACTIV all-wheel drive. 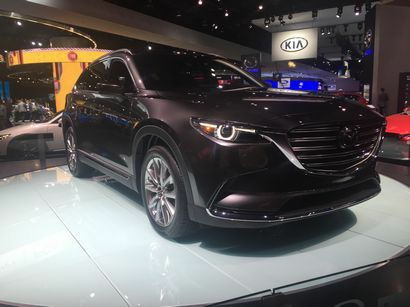 According to Mazda, the 2016 CX-9 is slated to go on sale in the U.S. in late-spring 2016.